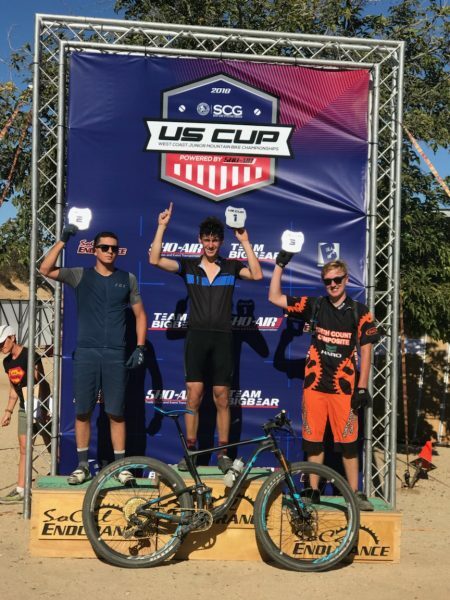 Dylan White, of Laguna Beach, earned first place in the 17-18 boys cross-country race at the U.S. Cup West Coast Junior National Mountain Biking Championships in Temecula. The U.S. Cup West Coast Junior National Mountain Biking Championships was held in Temecula, with Dylan and Brady securing podium placements in three of three races. Dylan clinched a first-place win in the 17-18 boys cross country race, and Brady placed third in the 13-14 boys cross country race and earned a second place win in the boys 13-14 Enduro race. Students interested in joining the middle school and high school mountain biking team can learn more at lagunabeachmtb.org. Training for the 2018-2019 season begins in October. Riders of all skill levels are welcome.